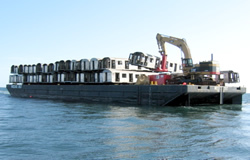 On April 3, 2008, 44 decommissioned stainless steel subway cars were deployed on the Atlantic City Reef site as part of the Artificial Reef Program. The AC reef is located 8.8 nautical miles offshore of the Absecon Inlet, has a depth range of 50 - 90 feet and is four square miles in size. Also located on the AC reef are Redbird subway cars, concrete, reef balls, telecommunication cables, army tanks, tires and various vessels all of which total just under 65,000 cubic yards of reef material. Three locations were chosen to be the final resting place for these particular subway cars. Site one consists of 15 cars, located at DGPS coordinates 3915.600’ 7414.400’, in depth range of 75 – 80 feet. Site two consists of 14 cars, located at DGPS coordinates 3915.375’ 7414.625’, in depth range of 75 – 80 feet. The third and final site with 15 cars is located at DGPS coordinates 3914.100’ 7412.600’, in depth range of 90 – 95 feet. The cars are placed in a tight circle pattern surrounding these coordinates to better accommodate divers. A total of 600 decommissioned stainless steel subway cars are to be deployed eventually, all being received from the New York Metropolitan Transit Authority (MTA). Each car is approximately 60 feet in length, 10 feet in width and 11 feet in height. Prior to deployment each car is stripped of all plastics, degradable materials and grease to avoid contamination to the marine ecosystem. 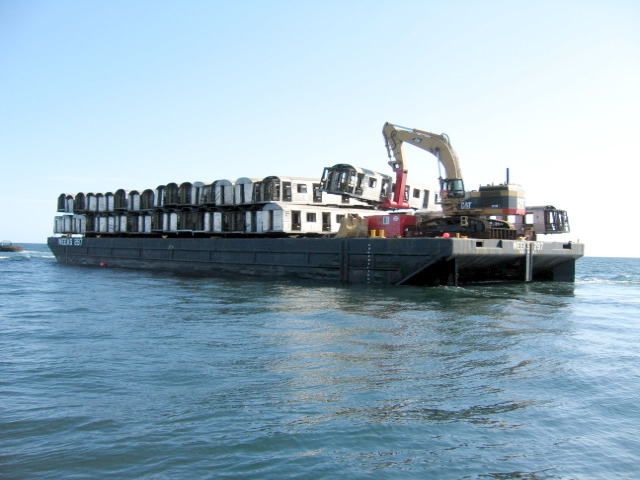 The MTA covers all costs for the cleaning, transportation and deployment to the artificial reef sites. The remainder of the cars are scheduled to be deployed at the Deepwater, Cape May, Garden State North and Shark River Reef sites.